A retail management system from Electronic Payment Systems, Inc. (EPS) is more than just a register system; it is a complete software and hardware solution that will increase your sales and improve your profitability. There are many benefits to having a retail solution from EPS; however, the bottom line is that a system from EPS will give you more control and a better understanding of your business. Remember the corner neighborhood store? How the owners got to know the patrons, their families and their shopping habits? 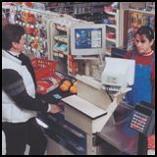 Loyal customers frequented that “corner store” because it was convenient and friendly. They liked being recognized by the store owner. They valued the “special” offers that were provided to them as “preferred” customers. Electronic Payment Systems (EPS) provides software to reintroduce that level of customer service to today’s growing retail business. There is little doubt of the benefits gained, increased sales and profitability, in properly executing a “loyalty marketing” or “frequent shopper” program. The software EPS created not only enables easy data collection, but also adds tools to analyze and manage this overwhelming amount of information! EPS interprets the raw data into useful real-world information that results in better business decisions, targeted promotions, more efficient operations, happier customers, and most importantly, increased profits. The EPS retail management solution is a user-friendly product that is more than a collection of computers, scanners, scales, wires and software; it is a business tool. A tool that provides target marketing, accounting tasks, integrated credit/debit, gift cards, staff supervision, training, inventory management and—most importantly—customer satisfaction. ● PDA Software…. All in one integrated package!